The other day I shared an insight into some of the crazy thoughts that have popped through my head. In all honestly I cringe at the thought of some of the things that I said in that post. Even as I sit here typing this I am gently rocking back and forth in my chair wondering whether this is something I should keep pushing on with. You see I am slowing beginning to think that we all have equally crazy thoughts at times. 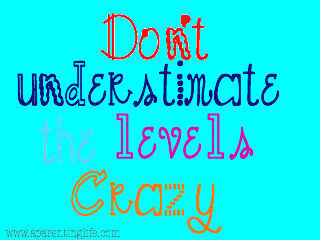 Some may be slightly crazier than others and others may have them slightly more often than some. But at the end of the day we are all full of our own little cup of crazy. Which to me makes it not so crazy and more like normal. Which I think is why I am thinking that sharing a few more of my hide in the cupboard crazies is a good idea. To create a whole new normal not just for me, but my readers at large. Failing that let's just hope it is at the least in some way entertaining. So in there interest of normalising crazy, particularly mine here I go. Before arriving at the Digital Parents Conference I had a whole heap of expectations. One of which was that I would be inundated with people who couldn't wait to meet me. And to some extent there was and please if you are one of those people reading this I really was touched and it did meant the world to me. However there honestly was a part of me that expected a little more. In some ways I envisaged a whole range of different people racing up to introduce themselves to me for one reason or another. And yes one of those reasons might have been to either offer me a book deal or sign me up as their number one writer for something or another. Not surprisingly (when you have reality firmly gripped) I was not mobbed upon my nearly late arrival to the conference on day one. I was however greeted by the lovely Tina who engulfed me with one of the warmest welcome hugs I have ever felt. My first thought was "I think she might actually know who I am" which naturally made me feel all kinds of special. However my special feeling quickly dissipated when others did not get so nearly excited upon my entrance. Which again is totally understandable for those who have a strong relationship with reality. Unlike myself at times. For me the entire conference was spent on an internal roller coaster trying to determine where I fitted in, not just in the blogosphere but almost in the world at large. For as much as it felt great being around so many like minded souls I also felt incredibly isolated and alone at times. Which may or may not have been a pure result of my crazy thoughts (actually it is but like I want to admit that). As I mentioned in my last post I let my crazy thoughts get so carried away I missed out on meeting the rather lovely Tiff. Only she wasn't the only one. Oh no, there is a whole long list. For the most part I am not beating myself up about it too much but there are few that I am just gutted I didn't manage find the balls to really talk to. Top of that list is Robomum. Another who requested my where abouts during the conference. Only by the time we actually managed to be in the same room at the same time there was barely enough time for a quick hello hug before we both had to rush off somewhere else. At the time I was a bit relieved because by this stage I was on the verge of my mini meltdown, though I don't think I realised it at the time. My levels of overwhelm had soared to new heights by this stage. The thought of actually having to talk to anyone, regardless of whether I knew them or not, made my stomach turn a thousand different ways. As I think about it now I really wish that I had pushed myself a little further. Robomum was on my list people I was hoping to connect with and I had the opportunity to and now feel like I threw it away. Not only that I have heard from numerous sources that she is as awesome in real life as she is on her blog. Talk about rubbing salt into the wound. The irony of the whole no one wants to talk to me despite me not being able to actually to anyone is not lost on me. Total crazy I know. I think I would have had the same cup of crazy thoughts if I'd gone top the conference. As it is, I just struggle to see where I fit into blogosphere life without knowing anyone in person. I think most people are too timid to rush up and say hello to everyone that kind of idolize and those who feel mobbed don't know why. I would totally have rushed up to you Rhi . Tiff is awesome in real life...not to rub more salt into your wounds.I felt very overwhelmed too at my first conference.